Kindly sponsored by Barclays Bank p.l.c. The Cumberland and Dumfriesshire Farmers’ Mart P.L.C. had forward 622 suckled calves at their annual show and sale on Saturday 3rd October 2009. An outstanding show of quality cattle met an unbelievable trade with a packed ring of keen bidders ensuring cattle averaged £761, up an incredible £117 on the year. We would like to thank Mr John Little who did an excellent job in judging the show, awarding the Championship to a Limousin heifer from Messrs W.H. & D.A. Gass, Nunscleugh, which later realised £1,170 to J. McAlister, West Thomaston. 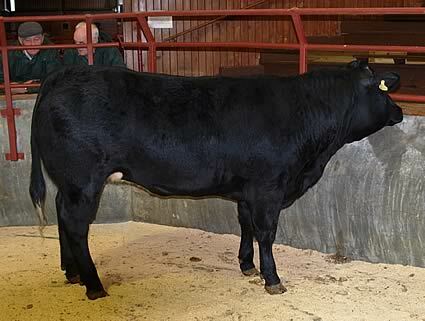 The reserve champion also went to Nunscleugh for a Limousin bullock which sold at £1,090 to the judge. The cup for Champion Charolais was awarded to Messrs W.G. & H.M. Kyle, Spoutbank for a smart 9 month old heifer which sold at £770 to Messrs Bainbridge, Greystones. Leading consignor averages:- High Dovecote £878, Walton Woodhead £862, Nunscleugh £860, Gallowberry £856, Trough Head £842, Miller Hill £837, North Greenhill £820, Hilltop £816, Spoutbank £813, Newbiggin £811, Holme House £810. Limousin £1,090, £995 Nunscleugh, £985 Greensburn, £950 (x6), £930 (x7) Nunscleugh, £930 High Dovecote, £925 (x2), £920 (x2), £910 (x3) Nunscleugh, £905 North Greenhill. Charolais £970 High Dovecote, £960 Spoutbank, £945, £930 (x2), £920, £895 (x9) High Dovecote. British Blue £890, £870 (x2), £830 Newbiggin. Limousin £1,170 Nunscleugh, £950 Newbiggin, £945, £940 (x3) Nunscleugh, £930 Newbiggin, £910 (x3), £900 (x8) Nunscleugh, £890 North Greenhill. Charolais £835 (x2) Spoutbank, £800 High Parkfoot, £795 (x3) Moss Side, £785 (x5) Chapeltown.